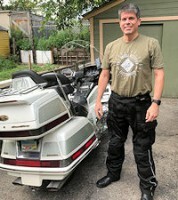 I Have 1987 Honda GoldWing Interstate and need to rebuild them. Is there a how to video out there or on this site? I tell you what.... Was a fairly easy task, but watch putting the caps back on. Compressing the springs were a task. Of course someone will give a good cheat that I'm un-aware of, lol. Almost lost the cap, top spring, and the washer that goes between the top and bottom... Keep your face away... Just sayin. Just did mine 2 weeks ago. Was the first repair for my birthday present.... Now working on electric.